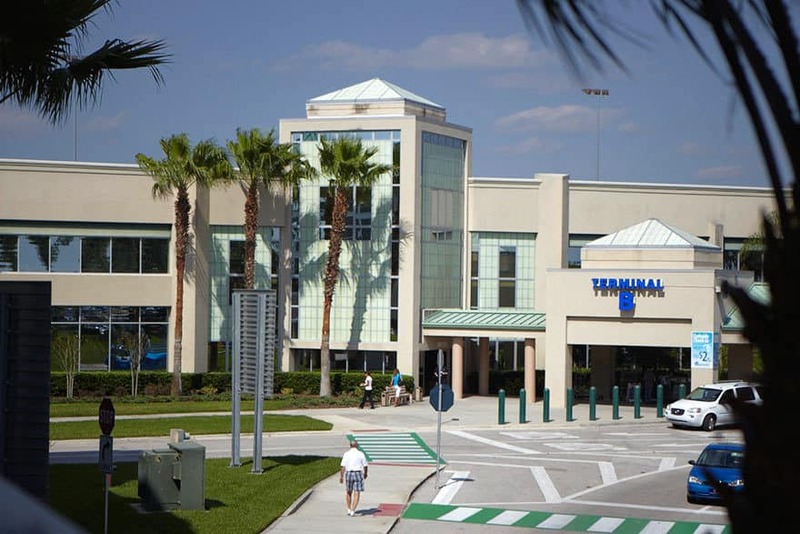 Orlando Sanford International Airport is owned by Sanford Airport Authority and operated by TBI Limited, one of the world’s largest airport operators. Given TBI’s international reach, much of the airport’s traffic is from British charter air carriers servicing the European market for entertainment travel to central Florida. Allegiant Air uses the airport extensively given its focus on the Orlando destination. Once a naval air station, Orlando Sanford is still a significant venue for flight operations training. Several areas of the subfloor had cuts in the concrete from earlier renovation projects.Transition areas and sections of the concrete that were filled during original construction presented especially irregular substrate conditions. The renovation plan called for certain existing floor coverings to remain in place with floor leveling compound poured above them. This view, on the right, of existing terrazzo flooring, bare concrete with a deep crack, and concrete with adhesive residue captures many of the challenges of a subfloor renovation project. Residual materials not bonded to the substrate surface are removed. All areas of the renovation space are thoroughly vacuumed with a commercial unit. Removing all dust and debris from the subfloor enhances the bond of the materials to be used later in the project. Areas around the base of the baggage claim ramp are taped to prevent leveling compounds from flowing underneath. Applying Schönox SHP, special acrylic primer, is easy and efficient using a low nap roller attached to an extension rod. Using SHP in busy areas is made easier given that SHP has no VOCs and conforms to SCAQMD low emission standards making its application a low odor process. Priming reduces absorption by the substrate, protects sensitive subfloors, binds residual dust, and improves adhesion of the leveling compound. Schönox SHP is ideal for use on interior non porous substrates drying in only 1 to 2 hours. Each one gallon container covers 350 to 500 square feet of floor space. Bags of Schönox ZM, cement based self-leveling compound, are pre staged at the renovation area. ZM is suitable on all cement and gypsum substrates as well as over floor coverings such as ceramic tile and terrazzo. Thorough mixing of the self-leveling material using the appropriate water amount allows the product to perform at its highest level. The excellent flow characteristics of Schönox ZM make its pouring and distribution an efficient process. Schönox ZM dries in roughly 24 hours when poured at a depth of 1/4” with a very smooth surface. The product can be installed to a depth of 7/8”. ZM is quickly spread around the renovation area using gauge rakes. With its very low emissions, use of the product even contributes to LEED credits. Schönox subfloor products took the baggage claim area from its rough uneven beginning, through the priming and leveling stages, and finally to a smooth strong subfloor ready for floor covering.